It's my honor to host Fun Monday this week and I'd like to thank everyone for signing up! In the midst of the busyness of our lives we tend to get overwhelmed by it that we forget ourselves. Most of us are inclined to look out for others first, yet we deserve to look for ourselves as much or even more. I believe we do! In fact we all need to learn to pamper ourselves and not just in times when we are stressed. So for this week, we're going to share each other's self pampering stories...from little pleasures to guilty pleasures! If there is one thing I learned through time, it's about us taking care of ourselves...pampering them and loving them, for no one else is obliged to do that for us. So today I'd like to share to you top recipients of Mariposa's income Mariposa's self pampering stories! 1. I am a massage slave! There are times when I get too tired that I have to request masseuse to come to the house even on weekdays! Hand in hand with my addiction to massage is my once in awhile trip to the Spa. I know to some massage is equal to Spa...but not for me! There are times, and this is like once a month or every 6 weeks...or when I just feel like it, that we go to Spa and get body scrub...facial...foot spa etc! 3. Having a lazy day! - staying in bed 'til 11AM, brunch in bed...not caring if I have brushed my hair...going around the house in my pajamas...watching movies 'til dinner time! Part of my weekends are more or less spent this way...after all, working at night is quite draining, so there are times I feel I need to recharge by getting so much sleep! Or getting a tea or milk bath! Milk bath is something I used to do regularly...like every weekend when I was in my teens...it changed when I visited some poor communities in College...though I still get to have this on rare occasions! 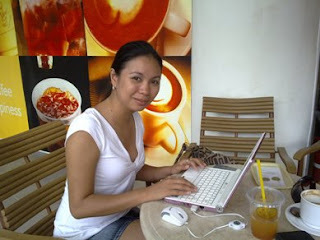 - going to my favorite coffee shop...blogging (writing and reading blogs! )...reading books...sipping my favorite mocha...enjoying the warmth of the sun...enjoying nature! Here are more photos of my favorite coffee shop. There you can see the view from where I sit. Check other participants' self pampering stories by visiting the links below. If you have not signed up yet, please add your link below! No problem for me, since I am retired I only pamper myself and the cats and sometimes Mr. Gattino, lol ! Great topic, Mariposa! I'm in,thanks for hosting! I've been with Fun Monday since the beginning, and we've never had a topic like that before!! I couldn't agree more. We certainly do need to take care of ourselves more often. Thank you for the reminder. This is tough because I don't really pamper myself so I'll get my thinking cap on to come up with something! I've got mine up! This one was a lot of fun - Thanks, Mariposa!!! I love hot baths! And I guess I really must try the spa-thing sometime. I'm not keen on massages per se, but a foot massage sounds heavenly. Perhaps I can find a place that just does that! Very good program for self pampering. I forgot to mention massages, I like them too, but they are very very expensive in Brussels so I do it when I am in Egypt on holidays. I agree with you about massages, they are so relaxing-lovely. Wow, a milk bath? Sounds interesting! Your coffee shop looks wonderful. Here's wishing you lots of pampering! Happy Fun Monday, and thank you for hosting! Glad you are able to have relaxation. Hope you have a great week ahead! You are a diva, indeed! Hey, could you come babysit Bethany for a bit while I see if can grab some spa time? Thanks Heaps!! I love massages, although I haven't gotten one in way too long. Years ago, it was one of my favorite ways of pampering myself. Also, when I was 24, I traveled abroad for six months, and one of my peak life experiences was a massage in Istanbul! I'm sorry I didn't get back into my routine to play this week. But I'm sure enjoying about everyones pampering. You are spoiled Mariposa - a massage every weekend. How can I sign up and get one on your monthly fee. Surely you get a discount -- ha ha!! I think if I could afford that - I would just have a pedicure, or foot reflexology. I love that. I need a volunteer for next week.